Daryl Gurney has picked up one point from his two Premier League matches so far this season. He went down to a 7-4 defeat against Michael Smith last week in a good quality tussle where both players averaged in excess of 100 for the bulk of the contest. With the match against Smith level at 4-4 he lost three legs in a row despite having the first dart at a double to win two of those three legs. It was the second week in succession that Gurney has lost three consecutive legs at the end of a match and in the process has seen a potential win slip from his grasp. Last weekend Gurney had a run to the final at the UK Open qualifier played on Sunday; on his way to the final he defeated Peter Wright in the semi-finals before losing to Krzysztof Ratajski in the final itself, that was Gurney’s first tournament final appearance since he won the World Grand Prix last October. Last week in Cardiff Gerwyn Price failed to build on his opening week draw against Peter Wright and was well beaten by Gary Anderson. He went down 7-3 to a very determined Flying Scotsman who looked very much in control throughout the game. He has averaged under 94 in both of his matches so far in the 2018 Premier League, and his overall average of 93.16 is the second lowest tournament average amongst the ten participants. Price competed in all three UK Open qualifiers last weekend and didn’t have any notable success, winning just four matches across the three days; he lost in the last 64 on both Saturday and Sunday. Daryl Gurney and Gerwyn Price both have one point to their name after two weeks of their debut Premier League season and are looking to grab their first win of the tournament. Over the opening two weeks, Gurney has played to an overall higher standard than Price; his tournament average is four points higher, though the finishing of Gurney has not been impressive as he has only hit 27.8% of his double attempts which is a poor return. Their head-to-head record is very much in favour of Price; he has a very healthy 6-1 lead in their past encounters which includes a 10-7 win over Gurney in round one at the Unibet Masters last month. In this match a lot will depend on how sharp Gurney is on his doubling out, as he has the ability to outscore Price and will create more opportunities to win legs as a result. 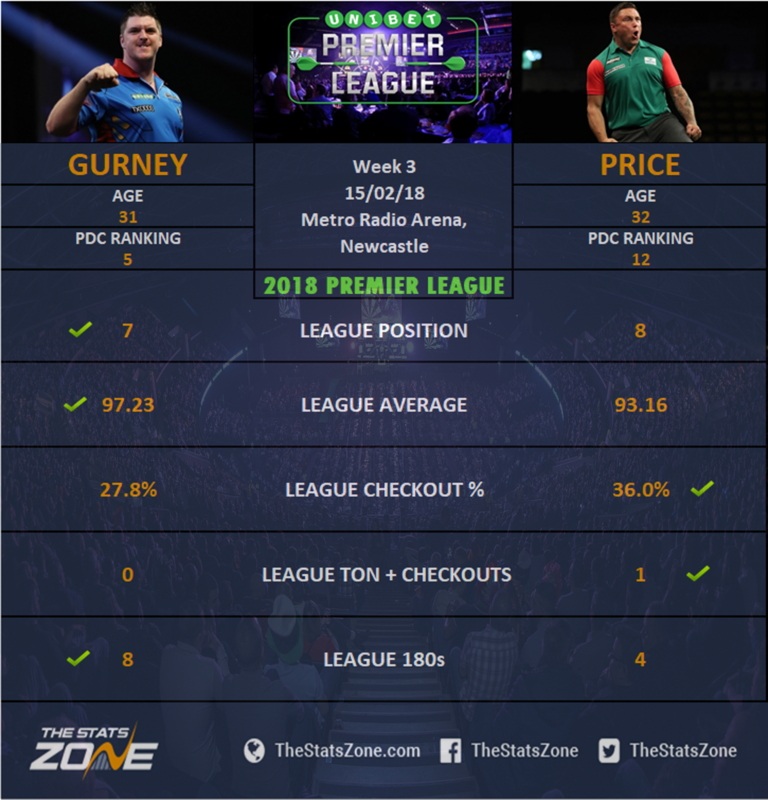 The run to the UK Open qualifier final at the weekend will have given Gurney extra confidence to bring into this match whereas Price hasn’t been showing great form which suggests the Northern Irishman can claim his first Premier League match win and leave Price still waiting for his.